Register Log In ECN Forum Forums Photos for General Discussion It's been that way for years, its fine! What a great Idea! Service drop doubles as a rain water collector. I'm sure the energized wires helps to sterilize the water too. Those wires are live arent they? 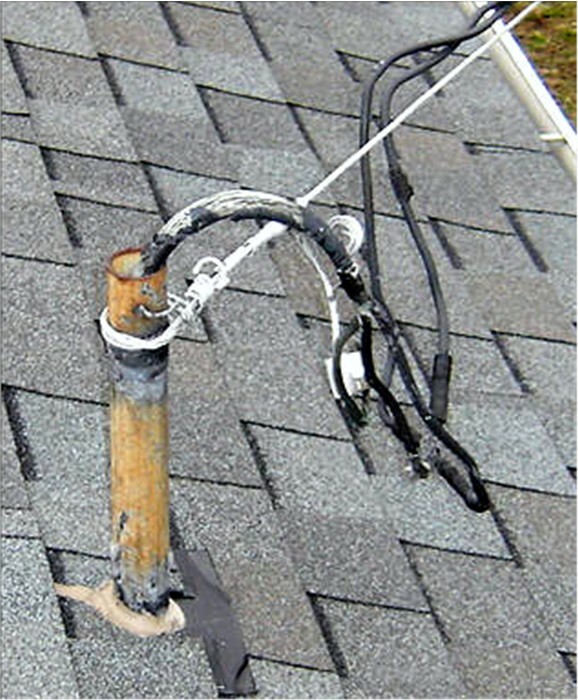 Is that a strip of insulation tape being used to patch a leak in the shingles behind that pipe? I did not take the picture so I can not provide any real details. A home inspector took this picture and included it in his report calling this 'service' out for evaluation. He got a call back. Received a call from my client today stating that the seller's agent had someone who was a retired inspector for the city and he said this is alright and there is no need to fix this item. Call me picky I think this should be fixed. Drop the service in through a plumbing vent...what a novel idea...now, if I can onlt find a combination toilet/load center! if I can only find a combination toilet/load center! Did the local POCO actually hook this up!?! Even when the cable was new, anyone with half a brain could see it was an accident waiting to happen! And triplex burns and explodes quite nicely, too.